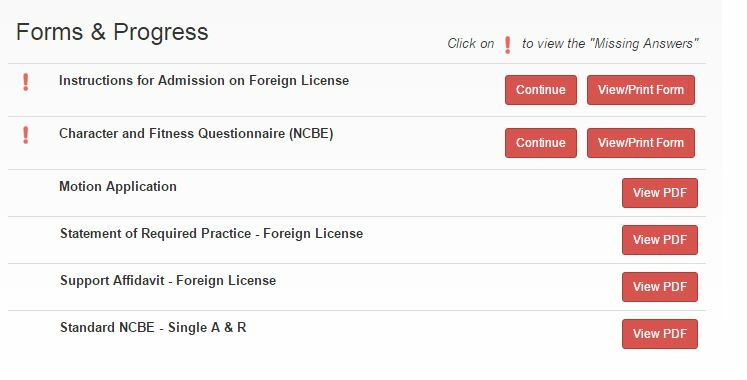 In order to apply for a Foreign License or Business Counsel License, you must register for an account on our website. This will take you to the registration screen. Please complete all of the required fields and submit your registration. You will receive an e-mail letting you know your account has been set up and instructions on what needs to be done next. We primarily communicate with applicants electronically rather than through the mail. Maintain at all times a current email address on your personal Indiana Board of Law Examiners registration page. Please make certain you use an email address that is unique to you and not shared by others. Add noreply@myble.courts.in.gov to your email address book and ensure our emails are not filtered as spam. Regularly visit our web page. You are charged with knowledge of all communications sent to the email address you provide on your personal Indiana Board of Law Examiners registration page and of all announcements and information posted on our website. Your application will not begin processing until they receive these documents, so make sure you mail them right away. If at any time you have technical difficulties, please click the gold button at the bottom of the screen and submit a technical support ticket.